A portable router designed to bring constant internet connectivity to tough locations in Sub-Saharan Africa and beyond was presented at the Design Indaba conference in Cape Town this week. The BRCK device from Kenyan technology firm Ushahidi can automatically switch between Ethernet, WiFi and mobile broadband to maintain its connection. It has its own battery with an eight-hour life to cope with power-cuts and intermittent connections, plus a built-in 16 gigabyte hard drive. "There's a gap in the reliability of the infrastructure and this is our answer," said co-founder of Ushahidi Juliana Rotich, speaking to Dezeen after her talk at Design Indaba. For her, creating technology appropriate to the location is crucial: "Why do we use technology designed for London when we are using it in Lagos?" 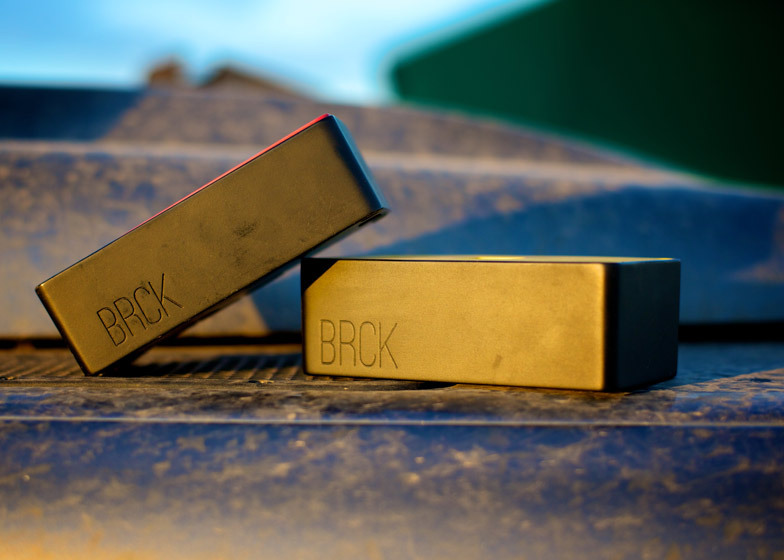 Rotich described the BRCK as "a rugged way to stay connected," adding that their mantra is: "If it works in Africa, it'll work anywhere." The BRCK's backup battery and multiple ways of connecting to the network mean that it will keep its users online even when internet connectivity and power is sporadic. From coders working in internet cafes in Nairobi to farmers working miles from large conurbations, the BRCK is designed to keep its users hooked up to the internet under the most difficult circumstances. Weighing 500 grams the device is 132 milimetres by 72 milimetres by 45 milimetres, similar to the size of a Mac Mini. It's designed to work in dusty locations, be physically robust and splash-proof. Up to 20 devices can be connected to its wireless network . The device enjoyed a successful Kickstarter campaign last year and is currently being refined by the Kenyan-based design team. Rotich hopes that the launch of BRCK can be used as a means of developing the manufacturing base in Africa, a path which will require political and economic changes, as she sees it. "We've shown we can prototype and make, but we still have to pay more than 100 percent duty on components – we have to make a tough business choice," said Rotich. "Ultimately we would love for the BRCK to be conceived in Africa, designed in Africa, made in Africa, used in Africa – and used around the world," she added.